Self-Care is a very important word in my somewhat full-of-activities life. When I first started Young Living, all I wanted to have were oils for my kid. She had (still has) her pouch of oils and I did not have. Whenever she’s unwell, I will use oils consistently for her wellness. When I was unwell, I just anyhow applied and let my body take care of itself. When I saw how Valor become out of stock quite often, I would keep the rest of Valor for my kid. Same things with other oils. All are HERS. I NEVER spare a thought for myself. I often worked myself until I was tired, and still, I never paid attention to myself. My body had screamed for attention, but I ignored. I also start my NingXia Red journey (and there’s no looking back), OmegaGize, Sulfurzyme, Super C, Longevity capsule, Mineral Essence and Super Cal or BLM. I take Digest Cleanse, Inner Defense, Life 5, and Essentialzyme occasionally. I did colon cleansing. Yes, probably some will think that so many stuff at one go. I did not start all of them at ONE point, but I added one by one until the final list currently. And how they change me inside out. From always-say-tired person to go-out-8-hours-still-okay person. And mind you, I push the not-so-smooth stroller (11 kg bare stroller) that even my sisters complained that it’s heavy. I often load the stroller with many stuff from groceries shopping to Young Living shopping. As my friend mentioned, I am more light-hearted now. Before, I never went to any trainings or classes with Young Living for almost 2 years! All info I got from my upline when I asked her (or she disseminated among her members), OneDrop fb group (the old one that’s full of non-compliant stuff which has been deleted), books such as Gentle Babies, EOPR/EODR, etc., all were mostly done by text-ing or msg-ing. The main reason I did not attend classes or training was because I was so occupied with taking care of my girl. I don’t regret that though. But how I wish I were more open with suggestions on letting others help me taking care of her. I was used to doing everything by myself to the point that my body could not take it anymore. Now that I start to let go of wanting to take full control of everything, I delegate. My husband is very supportive in helping me. I am thankful for that. If he can’t take care while I have to attend classes, I bring my girl with me. I just need to prepare snacks and handphone with wi-fi and she’s set … Opsss. Oh, she’s happy as long as I bring her out. True, I still can’t plan for a trip without bringing her with me. I will take it a step at a time. Do you know, the first step is the hardest? Sometimes we’re in our comfort zone for so long until taking the first step out is pretty difficult. It’s like there’s force to pull us back into our comfort zone. But once …. Once you’re out, you’re recharging your almost empty battery. It can be battery of fun, friends, family, faith, fitness, or other aspects of your life that need recharging. You’ll come back as a better person. At least, that what happens to me. That’s why I encourage you, my friends, to have a bit of time for yourself. Love yourself because by doing that you will be able to love others wholeheartedly. Self-care is sometimes very simple. 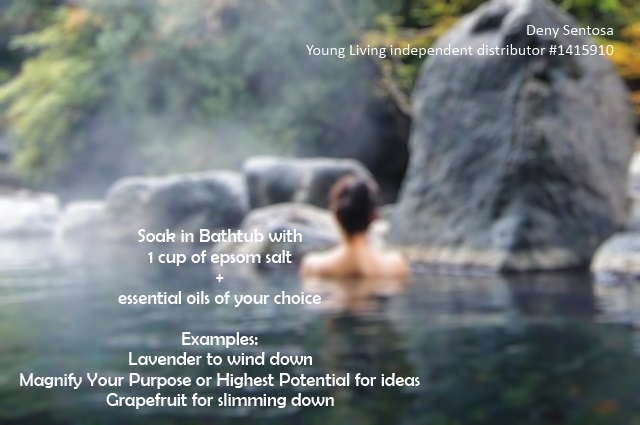 Just a soak in bath tub without interruption (attached is some essential oils recommendation for bath soak, you can always do your own bath soak recipe) can recharge ourselves. Or “do business” in toilet uninterrupted …. Or just watching my girl’s peaceful face while she’s sleeping (while I have my me-time). Or soaking in onsen, followed by dinner peacefully while outside is snowing, then read books by fireplace before dozing off……. (ok, this is too far-fetched because I don’t think I can be inside onsen without hearing my girl shout for me).